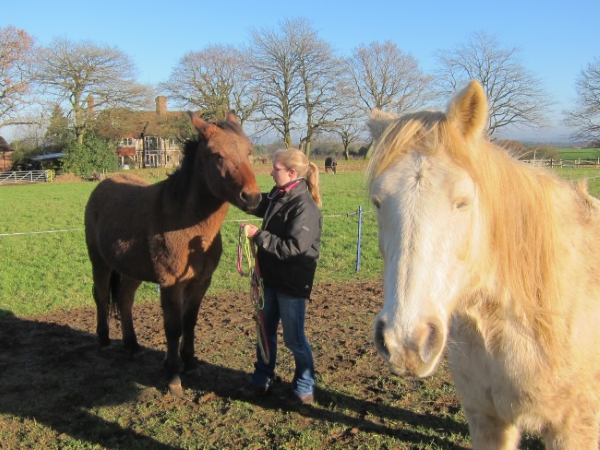 On Sunday we had a visit from Stacey Bevan, a healer and animal communicator who specialises in horses. I’d come across her name on a local Facebook group, where the topic of animal communication had been raised and Stacey came highly recommended. I initially contacted her out of curiosity; I’ve had a long term interest in the idea of communication, and I wondered if there was anything in it that could help my relationship with Marty. 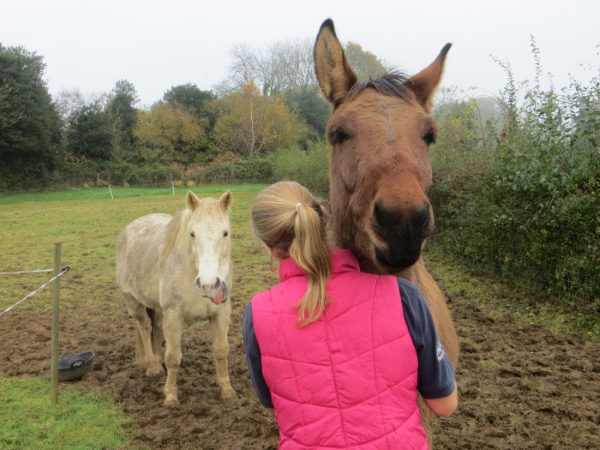 Stacey was keen to stress that the communication is only a very small part of what she does, and that she will not do one-off visits; her role is to help heal the animal, emotionally and/or physically, and that isn’t something that can be achieved without follow up. 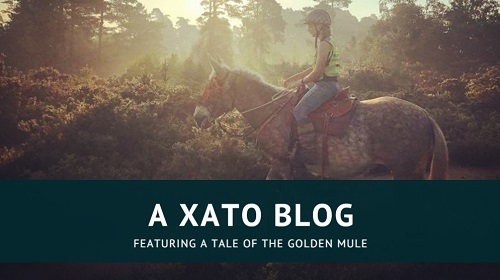 In light of this, I asked Ben if he would like her to see Cash, too; that little pony has long been an enigma to us, and we felt it would be helpful to both us and him if we could gain some insight into his mindset – or, at the very least, help him feel better about himself. Now I’d like to take a minute to say that I am well aware there will be many people reading this and rolling their eyes. This is my unashamed I’m-a-crazy-person post. But the thing is, we live in an incredible world full of extraordinary people, and if the worst thing that happens is that someone makes fun of me for thinking a little differently … well, been there, done that. I also feel that a lot of what might be written off as supernatural and woo is actually just a person’s ability to really observe and listen (“You see, but you do not observe”, as the Great Detective says). After all, when I first saw Ben work with horses I was blown away by the results he got. What was he, some kind of wizard?! 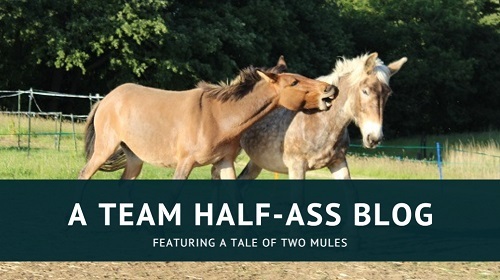 Their personalities summed up in one photo: mule stand-offish and aloof, Cash completely in your face. Anyway. Ben had to teach in the afternoon, so we gave Cash the first session in case we ran out of time. I won’t discuss Cash’s treatment here, but it was definitely an interesting thing to experience. Then it was the mule’s turn. Catching hadn’t been too hard for us, recently, so I was pretty disappointed when I went to fetch him in and he responded by pinning his ears and running away to hide behind Iris. Eventually, Iris lost her patience with him and started running around as well. I knew I’d never get him that way so I caught Iris, marched her down to the yard, handed her to Ben (who still had Cash) and stomped back to try again with Marty. Well, he wouldn’t even acknowledge me. He just kept trotting along the fenceline, obviously looking for a weak spot, checking the electric and acting as though I wasn’t there. He could not have ignored me harder. Without my existence even registering for him I was pretty powerless and, with nothing better to do, I admit I just stood there and cried. I must have made quite a pathetic figure, standing there clutching his rainbow halter, but it genuinely broke my heart. Where was the mule who used to be excited to see me? Who would notice (and announce) my arrival before anyone else and always, always come over to greet me – sometimes at a run? These days, he only walks towards me if the horses are already headed in my direction, and he never calls. To have something like that and then inexplicably loose it is enough to make anyone weepy. Comforting the mule who is being terrorised by the gurning Cash-monster. Or something like that. I didn’t want to go back down to the yard and face people until I’d got a grip on myself, so I stayed where I was – bottom lip wobbling – and as it turns out that was the right thing to do: because once he realised that jumping out would mean risking the electric, he suddenly changed course and came straight up to me to be haltered. He wasn’t happy about it, and he did his old run-back-in-panic-as-soon-as-the-knot-is-tied thing again, but … I had him. Once in the yard, however, he completely blanked Stacey – which was the exact opposite of how Cash had reacted. She noted how small and tight his mouth was, and he was definitely feeling quite overwhelmed – I recognised all the signs. Stacey suggested that we make this session a meet-and-greet rather than actually asking anything of him; she had been about to suggest that we just work him loose in the field when I’d eventually caught him, and she didn’t want this to become a stressful thing for him. If she pushed him, he would only associate her with bad things, and that was obviously not the intention at all. Stacey said she thought it was a confidence issue for him, which is what I’d suspected, but that it was a loss of confidence in himself rather than in me. As she said that, he suddenly began to lick and chew. That really amazed me: it wasn’t just a slight movement, it was a proper big release. Alright, you could argue that it was coincidence, and that he’d just happened to decide for himself that things weren’t so bad at the exact instant that Stacey voiced his concerns. I accept that. But the main thing is, he was definitely relaxing. And anything that helps my anxiety-ridden mulo feel better about the world is oki by me. This seemed to spark a change in Marty and, although he was still pretty closed off, he gradually became much happier about his situation and was able to share a little more with Stacey. He also decided he really wanted scratchies, and I knew then that he was feeling better because – even though he loves scratchies more than anything – if he’s feeling at all worried he won’t respond to them at all. This is very interesting to me, because it seems odd that he’s able to switch off like that. It would be like me not reacting to being tickled! It does appear that a lot of his anxiety lies with the loose horse incident. I’m not entirely convinced this is the whole problem, but it’s a start and confirms what I already suspected. Stacey explained that he couldn’t employ either of his usual defenses: he couldn’t run away, because I stopped him, and he couldn’t fight because he knows he’s not supposed to and there was also a risk of hurting me. The fact that I got kicked by the horse further compounds his feeling of having failed, and also shows me to be weak – how can he trust a leader who allows herself to get hurt? I also lost confidence due to the incident, and poor mule has interpreted that as me having lost confidence in him. His way of dealing with this is by basically saying “Nope – not doing it”. He was nervous again of the halter coming off, which hasn’t been an issue for a few weeks now. I am beginning to realise that it’s not necessarily a fear of the halter, like I thought; rather, I believe that the halter is a kind of scapegoat. He gets afraid or stressed or overwhelmed, and he places that emotion onto something tangible that he can fight or avoid. I think he fears being restrained. And to be fair, that’s entirely logical. As far as he’s concerned, I can’t or won’t protect him if danger threatens – he’s got to take care of himself. And how can he if he’s restrained? 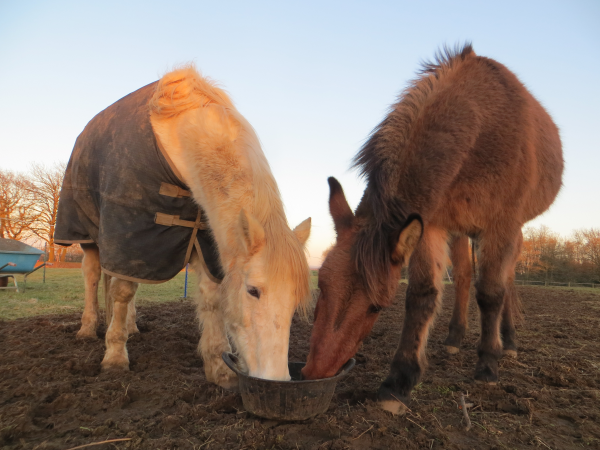 He’s not supposed to eat the horses’ dinner, but there was only a tiny handful left … and it made a cute picture. We ended the session just hanging out in the field, with the mule asking me to scratch pretty much every part of him until he eventually decided he’d had enough and wandered away. I am very much looking forward to our next session with Stacey on Saturday. I am not expecting miracles, but I have already gained a huge insight into how he’s thinking and feeling, and I really hope we can try and get to the root of the problem and help him overcome it. This little mule is exhausting and often frustrating, but he is so incredibly important to me and I know we have the potential to be magnificent. It’s just a case of finding the right key.